When I researched grit blasting, I looked into different stencil systems. When I trained to sandblast, I was shown only simple stencils (PVA glue swirls, lace lightly glued to the glass, sticky-back plastic cut away using a craft knife). These methods were not suitable for the the labels that I wanted to create. For these, my teacher recommended stencils that required weeding. Weeding (like its gardening equivalent) is a long and boring task. You use a small dental hook to remove individual tiny areas of the stencil that you have stuck to the glass. These stencils need a specialist cutter to produce them and do not allow the fine detail that I required. The weeding process is unbelievably time-intensive and would make etched glass prohibitively expensive. After some internet research, I discovered UV photoresist stencils. At the time, I struggled to find full instructions; the manufacturers of these stencils paint a very rosy picture and try to sell you a lot of very expensive peripheral equipment. So here is the full process that I go through to create your etched glass. All the artwork that I use has been drawn using Inkscape (Open-source software) in black and white. The black parts of the drawing will be etched and so confusingly turn white, the white sections will be unetched leaving the glass clear. Drawing a negative can be sometimes confusing. If I am struggling to imagine what the final etch will look like, I open the artwork file in GIMP (also Open-source software) and invert the colours. The artwork has to be produced to actual size. To check that it looks fine, I print it out on paper, cut it out and Sellotape it to the final glass to check for size. I send all of my artwork to a specialist commercial printer who prints onto acetate with completely opaque black ink. This gives me super-sharp images with the maximum detail and is well worth the cost. I do this after trying repeatedly trying (and failing) to print with a standard computer printer. If the black is not fully opaque, the stencil once exposed will have blurry edges and give your etches ragged lines. Essentially your work will look amateur, no matter how good your blasting setup. I use a generic unbranded UV lidded flat bed lightbox with a built-in digital timer. I have a lightbox less than A4 in size since I etch small items. The printed acetate is laid onto the plate (closest to the UV light) and the stencil placed on top. The lid is then closed and the light set for the required development time. The stencil works in one direction so I have laminated instructions to remind me: essential to avoid accidentally developing a stencil with mirror writing! I wash out my stencil in my steel bathtub which has a pull-out shower attachment. I have made my own washout spray (agricultural fine spray nozzle with standard brass plumbing connectors) that screws onto the shower hose. I fix the stencil to the bath with magnetic strips and hose down with warm water. This bit is quite fun but you do get quite damp from the water spray! The parts of the stencil not exposed to UV light are water-soluble and wash away. The rest is less soluble so the whole washout process still has to be done fairly quickly. It takes about one to two minutes in all. I drop blinds in the room with my UV lightbox and in the bathroom where I spray the stencil. The less UV light getting to the stencil before washout, the better. I have low energy LED lights in these rooms for the same reason. The stencil then needs to dry out for between thirty minutes and one hour before being applied to the glass. My cake cooling racks come in handy as you can see! This part is critical. If the stencil is not dry enough, it will disintegrate when grit blasted. If it is too dry, it will no longer be tacky, will not stick to the glass and will blow out when etched. There is a magic time window to this that I’ve learned through experience. As you can see, from the artwork acetate sheet in the image in (2) and from the image above, I produce several stencils of the same design at the same time. I use one to etch to order and store the remaining designs on waxed paper sheets, filed in plastic punched pockets until needed. The next time that I need a stencil with this design, I cut it out, either run it under warm water or moisten it with a wet lint-free cloth and repeat the drying process. I draw vertical and horizontal guidelines onto the glass (with a Sharpie pen, nothing specialised) and then attach the stencil which must still be tacky. I then use a small rubber roller to apply additional pressure, the stencil carrying sheet then needs to be removed and a wire roller is then used to puncture any air bubbles. I take a lot of care to inspect and remove these bubbles at this point. Stencil applied to glass ‘box’ bottle. Then I use the rubber roller again, apply masking tape to the glass not covered by the stencil to protect it during blasting, and pressure roller the tape and stencil one last time. At last! I do not leave the prepared glass long before I etch (the stencil will not stick consistently if left say overnight). I use a pressure pot with a foot control pedal for etching to keep my hands free to hold the glass in one hand and a lightweight blasting nozzle in the other. 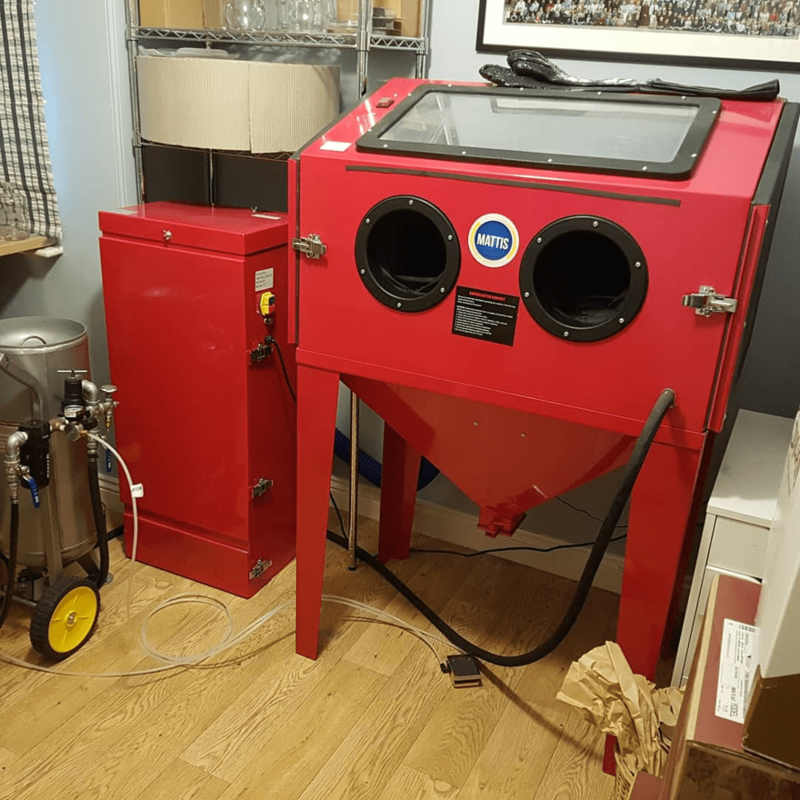 I have a standard sandblasting cabinet with a light and with vacuum dust extraction to enclose my work while I blast. I use silicon carbide grit to etch: it is the hardest easily available grit, it can be recycled many times before needing to be replaced, it doesn’t cause a build-up of static electricity (unlike aluminium oxide) and it causes a small glow as it hits the glass so you can see where you are etching. I blast with a fine tungsten carbide nozzle about 10 cm from the glass at a pressure between 25 (for fine work) and 35 psi (for a deeper etch). I’m fairly obsessive about carefully setting the pressure before I start blasting. If the pressure is too high for the stencil artwork requirements, you will give a lot of blow-outs and end up with a lot of wasted glass. After taking the glass out of the cabinet, I check the stencil has been fully etched before taking glass for its final cleaning. I wash the glass using standard washing up liquid to remove masking tape, stencil and Sharpie pen lines. And then carefully check for any blow-outs during the blasting process. Here are the links to get the Open-source software that I mentioned (if click on the image, the website will open in a new window). They have overlapping capabilities and it is well worth taking the time to learn to use them both. There are plenty of tutorials online (text and video) to help you. I have an Inkscape board on my Pinterest that you may wish to follow (link at the bottom of this page). When I started out, I used these programmes because I could not afford to pay £50 + VAT per month for Illustrator and Photoshop.